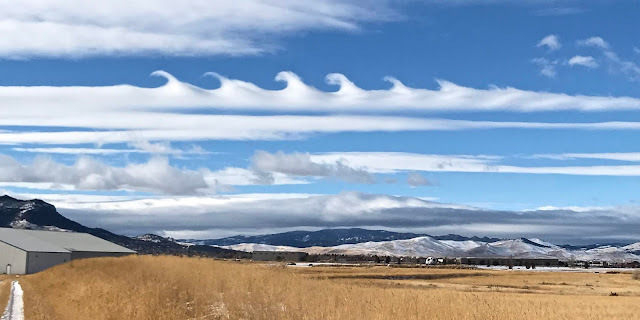 This photo of an amazing Kelvin-Helmholtz cloud was taken on January 26, 2019 by Hannah Martin, one of my freshman Earth Science students at Helena High School. She snapped the photo from the Helena Valley, looking west - Mount Helena can be seen on the left, and the distant horizon marks the Continental Divide. Also known as "fluctus" or "billow" clouds, they were named after Lord Kelvin (1824-1907) and Hermann Von Helmholtz (1821-1894) who identified the type of instability responsible for the unique waves. Such clouds are fairly rare, and may only last for a few minutes. The waves form at the boundary between layers of air that have different densities and wind speeds (wind shear). Air in the layer above the cloud is moving faster than air in the layer containing the cloud. Development of waves on the cloudy layer is similar to what happens when waves form on the ocean as wind blows across the water. In the photo the wavy layer is more dense than the clear air flowing above it - just as water is more dense than air blowing over its surface. The type of motion that causes the wave pattern is actually not that uncommon in the atmosphere, although we usually don't see it. In order for us to see it, clouds must be present in the lower layer (as they were when the photo was taken). We can't see clear air, but we can see clouds. One of the nice things about clouds is they provide clues about the type of motion currently happening in the atmosphere. Want to know more? - Watch the 4.5-minute video below, which includes a great demo.